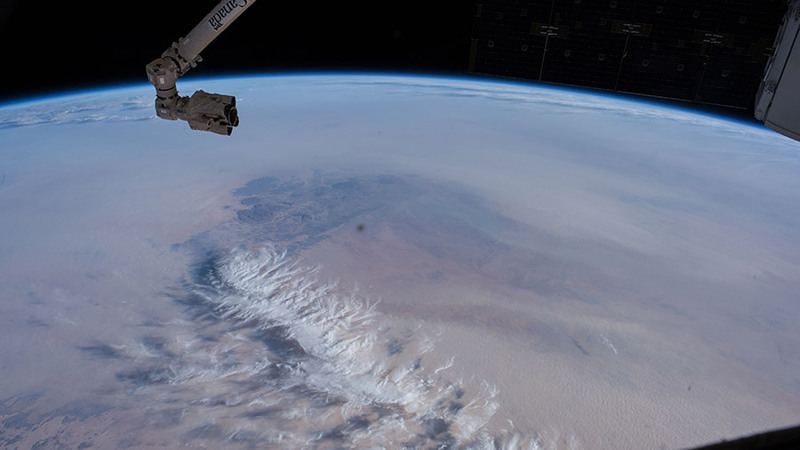 The Sahara Desert is pictured Dec. 24 as the space station orbited over the border of the African nations of Mali and Algeria. After a Russian cargo ship departed the International Space Station Thursday, the Expedition 54 crew is wrapping up the final work week of 2017 orbiting Earth and conducting science. The six astronauts and cosmonauts will go into the last weekend of 2017 with light duty and family conferences before taking New Year’s Day off. The Progress 67 (67P) resupply ship finished its stay six-and-a-half month at the station’s Zvezda service Thursday at 8:03 a.m. EDT. Cosmonauts Alexander Misurkin and Anton Shkaplerov packed the 67P full of trash the closed its hatches before it automatically undocked. It will re-enter Earth’s atmosphere and safely burn up over the south Pacific Ocean. Japanese astronaut Norishige Kanai took his turn on the exercise bike today for a study researching physical exertion in space. Doctors measure the astronauts breathing and other parameters during exercise to ensure they have the strength to perform strenuous activities such as spacewalks and even emergency procedures. Flight Engineer Scott Tingle of NASA was harvesting plants for the Advanced Plants Experiment-05 (APEX) and stowing the botany samples in a science freezer for further analysis. Scientists are exploring how plants respond to microgravity and observing molecular and genetic changes. The life science studies help mission doctors keep astronauts healthier and stronger while living in outer space. Also, NASA is planning longer human missions beyond low-Earth orbit and learning how to keep crews self-sustainable. Finally, three U.S. astronauts, two Russian cosmonauts and a Japanese astronaut on the orbital laboratory will experience New Year’s Eve 16 times as they orbit Earth once every 90 minutes. That is 16 sunrise and sunsets 250 miles above Earth. The crew will take the day off, share a meal and reflect on the past year and plan for the year ahead. The work these astronauts do for mankind is so outstanding and amazing it should always be on top of the world news here on Earth but unfortunately most of the humankind down here are so intent on destroying each other it hardly gets a mention. I love you for the work you do and hope you all return to the planet safely. Wishing all the Astro and Cosmo nauts a hearty end of year meal and a relatively relaxing day off. I’m not too keen on 67P’s fate, we have enough trash / garbage in our seas already, don’t need anymore coming in from space. Can’t we land it and dispose of it through standard recycling efforts? All the best to NASA and affiliated teams. You do a great job showing how all nationalities can pull together for the fulfilment of Man’s existence and understanding the world we all live on. I watched your space station pass over Gull Lake at 7:54 AM MST, 28 Dec, 200 km north of Calgary Alberta. It was -29 C and I was alone on the side of the lake. There was a red glow of dawn in the east. The experience was inspiring. The linkage between a glimmering object crossing the sky and the description of the daily activity on the space station is a great connection for me. I send a wish for good adventure in 2018. The self sustaining crew could possibly recycle manure and use it for farming. Could we land and reuse the garbage capsule and recycle/reuse some of it’s contents? I love space exploration and I think its very productive and important. Feliz año nuevo… Happy new year. Expedition53-54. Great work you guys are doing for the benefit of all of us on Earth. Thank You Happy New Year. Barry UK. Does the menstrual cycle change in orbit? Female astronauts experience menstrual cycles in space.